A config file (example in the below section, the Graphic User Interface (GUI) will generate config automatically), reads Files in fastq format, and a output directory are required when run by command line. Based on the configuration file, if all modules are turned on, EDGE will run the following steps. Each step contains at least one command line scripts/programs. The config file is a text file with the following information. If you are going to do host removal, you need to build host index for it and change the fasta file path in the config file. ##"N" base cutoff. Trimmed read has more than this number of continuous base "N" will be discarded. ## If reference genome exists, only use unmapped reads to do Taxonomy Classification. Turn on AllReads=1 will use all reads instead. 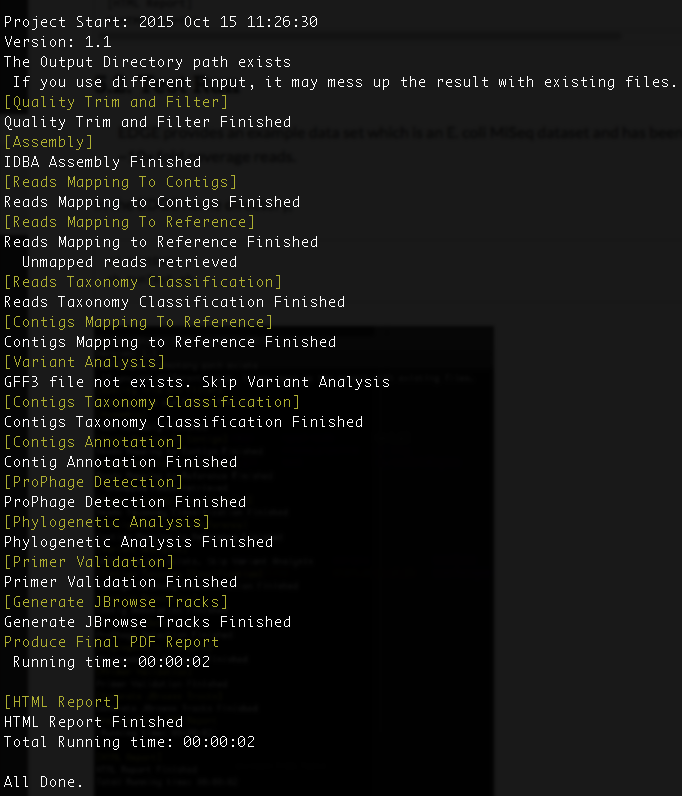 EDGE provides an example data set which is an E. coli MiSeq dataset and has been subsampled to ~10x fold coverage reads. Each module comes with default parameters and user can see the optional parameters by entering the program name with –h or -help flag without any other arguments. Iterative kmers de novo Assembly, it performs well on isolates as well as metagenomes. It may not work well on very large genomes. Taxonomy Classification using multiple tools, including BWA mapping to NCBI Refseq, metaphlan, kraken, GOTTCHA. Summary EXCEL and text files. Krona and tree-style plots for each tool. Analyze variants and gaps regions using annotation file. The rapid annotation of prokaryotic genomes. It produces GFF3, GBK and SQN files that are ready for editing in Sequin and ultimately submitted to Genbank/DDJB/ENA. Identify and classify prophages within prokaryotic genomes. In silico PCR primer validation by sequence alignment. Design unique primer pairs for input contigs. SNP based phylogentic tree in newick/PhyloXML format. Convert several EDGE outputs into JBrowse tracks for visualization for contigs and reference, respectively. EDGE post-processed files for JBrowse tracks in the JBrowse directory. Tracks configuration files in the JBrowse directory. Generate statistical numbers and plots in an interactive html report page.